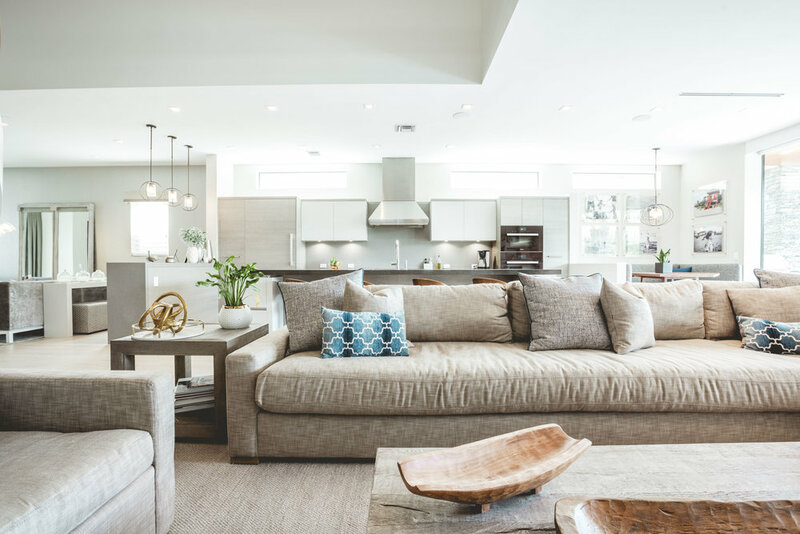 What began as a project to add a second story turned into a complete tear-down and rebuild for a family that splits their time between Delray Beach and New York. The new modern façade boasts stone accents and a cantilevered roof with a walnut tongue-and-groove element that warms the architecture. The contemporary lean continues inside, with blonde wood flooring, industrial lighting, and a kitchen that features honed, matte-leather concrete countertops, chocolate Miele appliances, and a custom wood dining table. The spiral staircase became the focus of the open-plan house, leading up to a second-floor loft area and geometric coffers on the ceiling, designed by Laure Nell Interiors. The monochromatic palette gets a dose of color with blue-and-white decorative tiles in the eclectic cabana bath.